Who Would Use Virtual Care? Why Would You Implement Virtual Care Into Your Practice? When Would You Implement Virtual Care? How Would You Implement Virtual Care? Virtual Care, also referred to as Telehealth, is the remote delivery of health care services and clinical information using digital technologies. Whether you know it or not, you are probably already implementing some virtual care aspects into your practice. Some examples of this are using your phone to talk to clients, updating clients via text on your smartphone, and emailing clients answers to questions they are asking you. However, virtual care can be so much more than this. The new advances in this digital platform can turn your practice into a 24/7 accessible “ brick and click” clinic, while simultaneously increasing revenue, efficiency, bolstering veterinary and client relationships as well as relationships between coworkers, and improving work life balance to decrease the chance of burn-out. The only current limitation to virtual care is the ability to prescribe and diagnose without a VCPR: in most states, one cannot diagnose or prescribe without having first provided a hands-on examination of the animal. Once a physical examination has been completed, then veterinarians can diagnose and prescribe as they see fit. Even without a VCPR, most states allow veterinarians to provide general advice or perform emergency triage services for their clients. With or without an existing (VCPR), interactions between a veterinary professionals and patients can occur through instant messaging, video conference calls, sharing of lab results online via applications on your phone, including radiographs and ultrasound images, sharing of patient records, and other means of communication that fall into the the digital sphere. The are many virtual care companies out there to serve veterinary professionals and their clients, companies who are striving to create a better experience for both veterinary professionals and their clients. Some of these companies include whiskerDocs, BabelBark, and Pet Coach. They are making it easier than ever for veterinary professionals to integrate virtual care into their practice while ensuring that every legal precaution is adhered to and liabilities are eliminated. Why would you Implement Virtual Care? Ensures that opportunities for service to clients are not missed such as after-hour care, care when the primary veterinarian is not available, etc. It has been shown that pet parents who utilize virtual care are more likely to spend more money and come into the clinic more often than pet parents who do not utilize virtual care. Helps create a system where patient records can be shared between practitioners and between veterinarians and clients. Veterinary professionals can be available to clients on a 24 hour basis, but do not have to necessarily be present in the clinic. Enables veterinarians to communicate more effectively with their clients resulting in less miscommunication and happier clients who support their pet’s veterinarian instead of cutting them down. Allows for customization of service and care based on the individual needs of the veterinary professionals and/or the client. WHEN WOULD YOU IMPLEMENT VIRTUAL HEALTHCARE? WHEN WOULD YOU NOT IMPLEMENT VIRTUAL HEALTHCARE? There is almost no application where virtual care can not be implemented; however, implementing telemedicine, which involves diagnosing and treating a patient, is a more complicated application due to the lack of a VCPR. 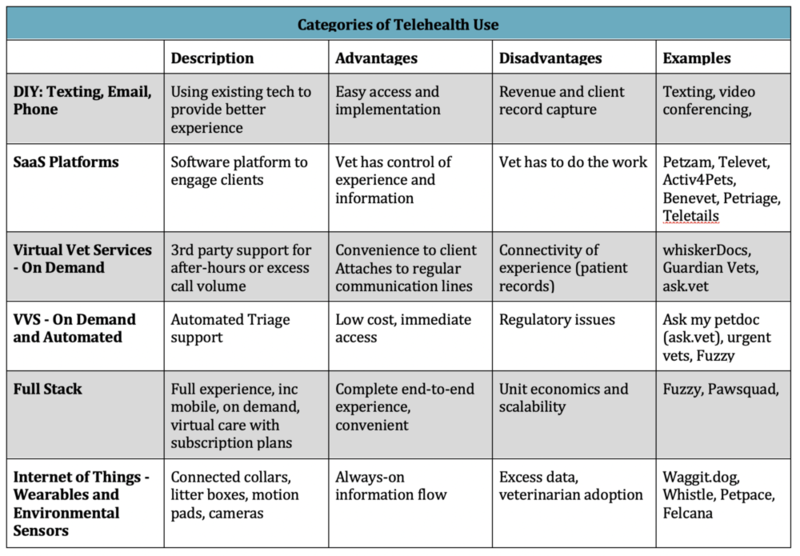 A new client without a VCPR can use telehealth to speak to a veterinary professional for advice on “when” the patient should be seen , but not “if” the patient should be seen. A new patient should always be physically examined at some point to establish a VCPR. HOW WOULD YOU IMPLEMENT AND USE VIRTUAL HEALTHCARE? First step: Analyze your practice or your current workload and find 10-20 items that could be transitioned to virtual care. Examples include client phone calls asking about what to feed their new puppy or what they should do if their cat has been vomiting for three days. Another example is sharing updates to your client from the on the patient's status after surgery while the patient is being hospitalized. Second step: Call or visit the website of different virtual care companies that fit your needs. The database and descriptions of these companies can be found here: (link to page on our website with company list). Third step: Virtual care company would guide you through the process of integrating their software into your practice or you could even apply for a job as an independent contractor through that company. Fourth step: Market virtual care options to your clients via social media, email, brochures, posters, brief conversations during appointments, etc. Fifth step: Check up on clients via email, surveys, speaking to them during appointments, and phone calls to gauge how they are liking Virtual Care and if they have any suggestions for improvement.